About 760 species of spiders have been recorded from Washington, but this number underestimates actual species diversity. 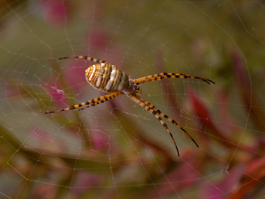 A moderate-size organic orchard would likely have more than 50 spider species. However, not all of these would be common or easily observed. Two large groups of spiders can be recognized according to how they capture prey. Web-makers (about 55% of species) construct silken webs of many different forms. Arthropod prey fly, fall, or blunder into the web and are held until subdued by the spider. Hunting spiders (about 45%), do not construct webs although they do produce silk. Rather, they capture prey with their legs and mouthparts. Some hunting spiders actively pursue prey whereas others adopt a sit-and-wait strategy and allow prey to come to them. Spiders are generalist predators. Because of their diversity in size, form, behavior, habitat use, and hunting strategy a large range of prey, primarily insects, is taken that may include beneficial insects and other spiders. Generally a spider captures prey smaller than itself, but because the spider increases in size with each molt, average prey size also increases. First instar Phidippus nymphs, for example, capture small prey such as aphids, thrips, and leafhoppers. Adults, however, can handle full grown earwigs and leafroller larvae. Spider eggs are laid in groups enclosed in a silken egg sac or cocoon. The number of eggs varies with the species and may be as few as 10 or 20 to as many as 1000 or more. The form of the egg sac is variable and may reveal the identity of its maker. 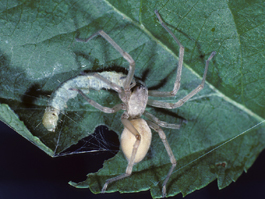 Some egg sacs are deposited in relatively exposed situations, but others are placed in a sheltered location such as within a folded leaf. The female spider often remains with the egg sac until the eggs have hatched and the spiderlings have dispersed. A wolf spider female attaches the egg sac to her spinnerets and carries it around with her. The immature spider is a miniature replica of the adult and molts several times before reaching sexual maturity. The number of molts required to reach adulthood varies from species to species but is often 5 to 10. Even within a species the number of molts can vary to some degree, and males, since they are often smaller than females, may molt fewer times. Spiders do not molt after reaching adulthood (with the exception of tarantulas and their relatives). The main features that distinguish an adult from the preceding immature are increased size and a functional reproductive system. Characteristics of the reproductive organs are the main criteria used by spider taxonomists to differentiate species. A considerable range in size is observed among the spiders found in an orchard. Many adult sheet web and dwarf spiders (Linyphiidae) are only 2 or 3 mm long, whereas jumping spiders (Salticidae) in the genus Phidippus can reach 15 mm in length, and some female orb-weavers (Araneidae) are even larger. Size increase is also observed within a species as it progresses through its life cycle. First instar Phidippus nymphs are only a couple of millimeters long. The adults, reached after several molts, may be 15 mm long and weigh many times more than the first instar. The vast majority of spiders found in Washington orchards have a single generation per year (univoltine). However, different species mature at different times during the season from the spring to the fall. As a result, at any given time adults of some species will be present along with immatures of others. Overwintering also takes place in various stages although most species do so as immatures. Spiders pass the winter in protected locations such as nooks and crannies in the bark and in the soil and litter on the orchard floor. Some species may overwinter outside of the orchard, and many species will utilize artificial shelters such as cardboard bundles and strips if they are placed in the orchard at an appropriate time. An orchard can be divided into three main habitats: trees, understory vegetation, and ground surface. 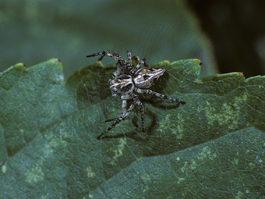 Spiders are abundant in all three, but individual species may be more or less habitat specific. Some species are primarily arboreal, others prefer the understory vegetation, and some move rather freely between the two. The ground surface fauna consists of a greater proportion of habitat specialists than the arboreal fauna or that of the understory. A main factor is that two large families the wolf spiders (Lycosidae) and the ground spiders (Gnaphosidae) are mostly restricted to the ground surface and are rarely found in the understory or the trees. Spiders begin to appear in orchard trees in March and April. In organic orchards the total number of arboreal spiders generally increases from the spring to the summer and reaches a peak in August or September. At these times one or more spiders can often be taken per beat tray. Spider numbers may remain high during October, but as leaf fall progresses they move out of the trees and few are left by mid-November. Many spider species that occur in orchards are also found in nearby, non-orchard habitat, especially native habitat such as riparian areas and sagebrush steppe. These areas may benefit spiders by providing alternate prey and hosts as well as sites for mating, egg-laying, and overwintering. Such areas may serve as sources of spiders that can colonize newly established orchards or re-colonize after disturbance. 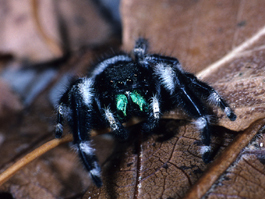 Jumping spiders are readily recognized by the pair of large, forward-facing eyes (the other 6 eyes are much smaller). Jumpers range in length from a few mm to 15 mm. Some species are colorful or strikingly marked. Jumpers are daytime hunters and use vision to stalk prey, pouncing on it from a distance of a few body lengths. In orchards jumping spiders have been observed feeding on white apple leafhopper, western tentiform leafminer, aphids, thrips, caterpillars, pear psylla, ants, various flies, earwigs, other spiders, and various predatory and parasitic insects. Oxyopes scalaris is the only lynx spider known to occur in Washington, but it can be quite abundant in orchards. Body shape and eye arrangement are characteristic, and the legs are quite long and spiny. Oxyopes is an active, daytime hunter with good vision. It is a fast runner, a good jumper, and reaches a maximum length of about 8 mm. Orchard prey records include white apple leafhopper, western tentiform leafminer, aphids, Campylomma, various flies, ants, other spiders, and parasitoid wasps. Crab spiders are indeed crablike in appearance and can move in a crablike fashion. The front 2 pairs of legs are larger and more powerful than the rear 2 pairs and are used in prey capture. 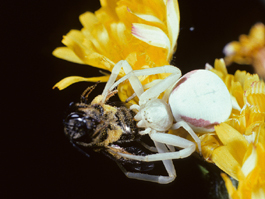 Crab spiders often have cryptic coloration and usually employ a sit-and-wait prey capture strategy. They are capable of capturing prey considerably larger than themselves including dangerous prey such as bees and wasps. Maximum size is 8-10 mm. Orchard prey records include white apple leafhopper, aphids, thrips, European red mite, pear psylla, stink bugs, small flies, and other spiders. These spiders are somewhat similar in appearance to the crab spiders, but the legs, which are long and slender, are all much the same. The body is rather flattened and the legs are typically spread out from the body. Usually rather dull in color philodromid spiders often employ a sit-and-wait prey capture strategy. They can, however, run very rapidly. Several species in the genus Philodromus have been collected in the trees while Tibellus is more frequently found in the understory. Orchard prey records include white apple leafhopper, European red mite, aphids, pear psylla, various flies, and other spiders. This is the largest family of spiders in North America with nearly 1000 species. Most are small or minute in size (< 5 mm), and some species can be very abundant in orchards. Linyphiids are web-makers, and a variety of small insects are captured including white apple leafhopper, western tentiform leafminer, aphids, thrips, small flies, and small, parasitoid wasps. This family of hunting spiders is active primarily at night. The day is spent in a silken retreat, often in a folded leaf. Cheiracanthium mildei, our most common orchard-inhabiting species, is an introduction from the Old World. It is dull yellow in color, has legs that span about 2.5 cm (~1 inch), and is a fast runner. Males and females are similar in size. Extensive tests with C. mildei indicated that it is potentially a very good predator of leafroller larvae. It also consumed leafroller egg masses. 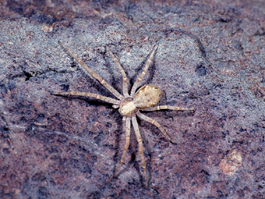 Wolf spiders and ground spiders, respectively, are largely restricted to the surface of the ground. Most species are active hunters and ground spiders are primarily nocturnal. Body length alone of some wolf spiders exceeds 1 cm. Little is known of the prey preferences of either group in Washington orchards, but it seems possible that they include spun-up codling moth larvae in their diets. Monitoring the arboreal fauna is probably best accomplished with a beating tray, since most species, including web-makers, are dislodged by this technique. Some nocturnal spiders that spend the day in silken spin-ups may be more difficult to dislodge; thus, their numbers may be underestimated. Spiders in the understory can be monitored with a sweep net once the vegetation reaches a sufficient height. Pitfall traps can be used to monitor the ground-dwelling spider fauna. The main factor affecting spider abundance is insecticide use. Spiders can be very abundant in organic orchards, but spider numbers and diversity tend to be very low in conventional blocks. Even one or two applications of a broad spectrum insecticide during the season can severely reduce spider numbers. Commonly used insecticides and acaricides are generally moderately to highly toxic to spiders.